The second pair of NP-BX1 batteries are just as bad as the first two. In fact, all four perform worse than the nearly two-year-old Wasabi batteries I’ve been using. The graph shows the test results from my CBA III analyzer. All batteries were all charged in a Wasabi wall charger. The top solid red curve shows the as-delivered performance in late 2015 for the battery I labeled “G”, tested at 500 mA. It delivered only 1 Ah, not the claimed 1.6 Ah, even at that relatively low current, but has delivered over one hour of service in the camera. The top dotted-blue curve shows the as-delivered performance for the NEW battery I labeled “J”, also tested at 500 mA. It delivers only 0.88 Ah, 55% of the claimed 1.6 Ah, at a much lower voltage while discharging. After two years, OLD battery “G” has more capacity and a higher voltage than the NEW battery “J”! The lower curves shows the results for the four most recent batteries I labeled H I J K, all tested at 1 A to better match the camera’s actual current; the dotted traces mark the second test of each battery. The orange traces show battery K has about 0.77 Ah of capacity, less than half of the claimed 1.6 Ah and much worse than the others. I also re-tested battery old battery G at 1 A, as shown by the dotted red curve labeled “G:2017-09”. It outperforms ALL of the new batteries! Batteries H and I have date codes BQF22, which I interpret as 2017-06-22: fairly recent stock. Batteries J and K have date codes BPL28: 2016-12-28. 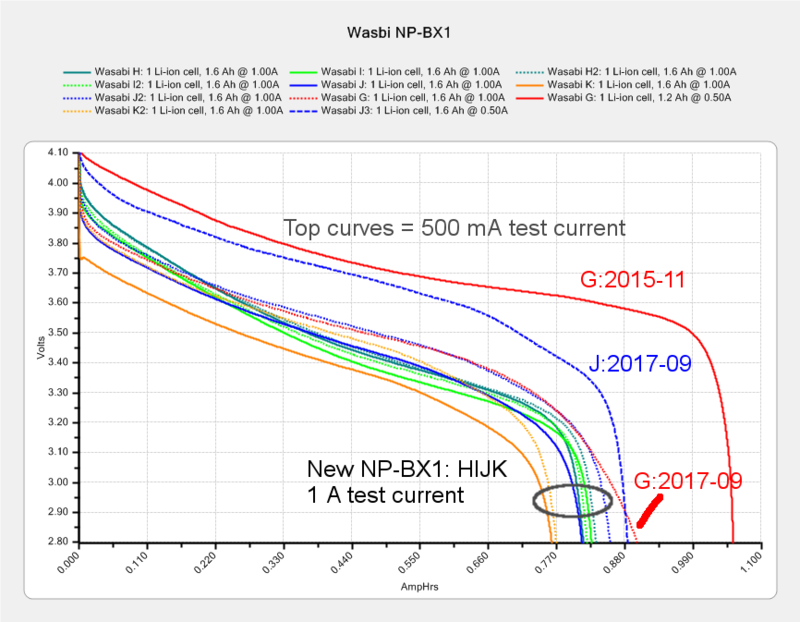 They’ve been sitting around for a while, which may account for the poor performance of battery K.
These Wasabi batteries cost roughly twice (*) as much as they did in late 2015, have /much/ lower capacity, and, to judge from the date codes, they’ve been consistently poor since late last year. It’s worth noting that Wasabi NP-BX1 batteries are currently $16 for the pair on Amazon and were $9 in late 2015. Allegedly genuine Sony NP-BX1 batteries run $50 MSRP and a suspiciously consistent $37.99 from all the usual big-box sources, including Amazon, where they’re out-of-stock for the next few months. Combining the number of counterfeits in the supply chain with Amazon’s commingled SKU stock bins, I have my doubts about what I’d get by increasing my battery spend by a factor of five. I think it’s about time to conjure an external 18650 holder / helmet mount for that camera and be done with it.